Researchers from the University of Washington and UW Medicine organized a panel session about firearm risks and safety for Chinese community members at the Stan Head Cultural Center in Bellevue on Tuesday. The hour-long event, led by Harborview Injury Prevention and Research Center (HIPRC), provided public health information about injuries and deaths involving firearms in the community and nationally. The panel included HIPRC research scientist Brianna Mills, Avanti Adhia, a postdoctoral fellow at HIPRC, Vivian Lyons, Erin Morgan, and Anne Massey, graduate students in the UW Department of Epidemiology. All are part of violence prevention research and projects at HIPRC. The panel emphasized data that showed the low absolute risk of firearm assault in Bellevue and spent time talking about the higher risks of unintentional or self-inflicted firearm injury, especially among children and teens of first-generation immigrant families. “Our goals were to help this community have a better understanding of the statistics and science of firearm injury and death and to provide them with publicly-accessible and evidence-based resources to build on the conversations we had today and learn more for themselves,” said Mills, who is also an alumna of the Department of Epidemiology. The panel is part of a series of educational events organized by the center designed to celebrate Chinese culture and to help new immigrants learn about and adapt to life in the United States. When Mahlon Meyer, director of cultural affairs at the Stan Head Cultural Center, noticed a sharp interest in learning about firearm safety by community members, he sought out the help of academic researchers who could inform them about firearm injury risks and safety in their area. Audience members engaged in a lively discussion with presenters, with particular interest in advice on how and when to broach difficult conversations—such as talking to children and teens about suicide. Asking friends and neighbors about firearm ownership and storage might also be difficult for immigrant parents who worry the questions might be considered rude, said audience member Lily Tong. “I never asked; I didn’t pay attention,” said Tong, a financial analyst and homemaker who has lived in the United States for 18 years. 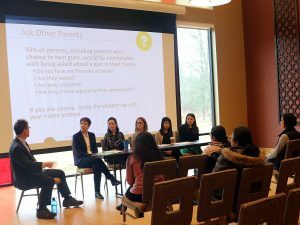 “But now I know, and I’m going to ask.” Panelists noted that research has found most parents are open to being asked about firearms. Tong said she’s become more interested in learning about firearm violence and prevention since having children and hearing about violence in schools, and she appreciated the opportunity to talk with researchers in the field. “More people knowing about this is better for the community,” she said. This event is part of the mission of researchers at HIPRC to provide the public with research, education, training, and public awareness about the impact of injury and violence on peopleʼs lives. This release originally published by the UW Department of Epidemiology.